In August 2016 they released their long awaited debut EP Waves- a colourful mix of upbeat and incredibly catchy tunes. Good Nature is gaining recognition not just in Alberta but nationally. In April of 2016 they became a Top 10 regional finalist in CBC Music’s Searchlight competition, with their single “Waves”. With over two thousand applicants across Canada, Good Nature was spotlighted by CBC music as a standout in the competition. They have had radio play on Mix 107, 102.3 Now Radio, CBC, CKUA, and campus radio in Alberta and BC (CiTR, CHLY, CJSR, CJSW, CKXU, Heatwave Kelowna). They have also racked up over 36,000 plays on Spotify since their EP release and 8000 views on their “Waves” music video alone. "Revolutionary People" their newest single, was released on all streaming platforms on September 7, 2018. The original core was formed in the fall of 2013. Since then they have spent years practicing, writing, and performing together to hone their sound. Over that time they have learned to adapt to each others personal styles and encompass a variety of musical influences to create something magical: Good Nature’s unique sound. Their name perfectly portrays their songs which have encouraging messages, upbeat tone, and emanating positivity. This makes it perfect for anyone who loves happy, danceable songs. Good Nature has performed at many different venues in Edmonton, including The Starlite Room, The Station, The Rec Room. They have also established a following throughout Alberta, BC and Saskatchewan after completing two Western Canadian tours. Good Nature will no doubt continue to build their following as everyone can enjoy Good Nature’s up-tempo, catchy music and their exhilarating live shows. Aaron Matheson is the guitarist and one of the two lead vocalists in Good Nature. He began playing piano at the age of 6, and guitar at the age of 12. Besides playing guitar and singing for Good Nature, he is the main songwriter of the band. Ronen Iosilevich is the keyboardist as well as a vocalist and songwriter in Good Nature. He is a classically trained pianist, and he has been playing since he was 9 years old. Besides playing keys and singing in the band, he is the business man of the group. He gets all the gigs and replies to all the emails. Elli Bookhalter is the drummer for Good Nature. Since first learning the drums in grade 9, he has been involved in many musical projects of varying styles. Elli is also paving his way as a composer and just recently completed his Bachelor's Degree in Composition from MacEwan University. Fred Mack is the band's saxophone player. He started his musical journey on piano at a young age and began playing saxophone in junior high school. He recently graduated from MacEwan University with a Bachelor's Degree in Jazz and Contemporary Music. Fred is also an active member of Edmonton's jazz scene. Curtis Mokry started playing bass around age 12 and grew up playing classic rock and blues covers with his brothers. When he isn't playing with Good Nature, you can find him riding motorcycles, quading, building guitar pedals, or studying Biomedical-Mechanical Engineering at the University of Alberta. 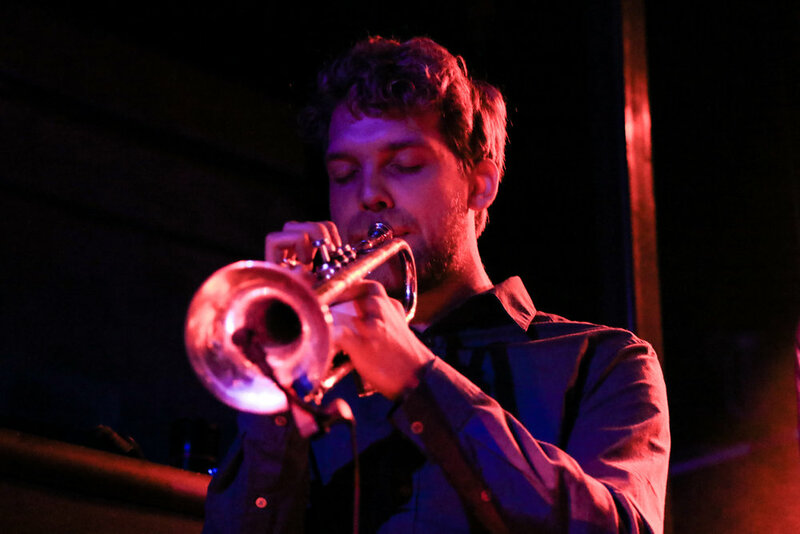 Anthony (Tony) Woloszyn is the trumpet player and Good Nature’s newest member. He started out on the piano and drums before focusing in on the trumpet in junior high school. Tony has experience playing for MacEwan University’s musical theatre productions, plays classical trumpet in the Edmonton Youth Orchestra, and dabbles in the Edmonton Oilers Drum & Brass band.